Dubai, UAE, June 11, 2018: Excitement is building and the countdown has begun – in just a few weeks, the most successful national soccer teams from around the globe will meet in Russia as they battle it out to be crowned world champions. The Swiss team will also be there, and its players will be accompanied by an especially stylish ambassador from their home country: the Manero Flyback by Carl F. Bucherer, which was personally presented to each player during the last training camp prior to soccer's premium event. On May 31, 2018, in Lugano, the watches were presented to each player in person during the final train- ing camp prior to the team flying to Russia. The presentation took place in the presence of Renato Bonina, Executive Vice President Sales Europe at Carl F. Bucherer, and Claudio Sulser, Delegate of the Swiss national team. As part of the ceremony, the players also signed an atmospheric picture of the watch. The signed complete work of art will be auctioned off as part of the Golf Trophy Engelberg charity golf tourna- ment, with the proceeds going toward youth development at FC Luzern. Just like in soccer, everything in the world of watchmaking revolves around time and teamwork. All of the individual parts within a movement must fit together perfectly in order to perform well as a whole. This understanding is also expressed in the campaign slogan of the partnership between the Swiss Football Association and Carl F. Bucherer: “A single second can change history.” Over the 90 minutes of a soccer match, and longer in some cases, every shot and every piece of action can make the decisive difference – and even write history. In keeping with the motto of the global Manero Flyback campaign, “Wherever time takes you, Lucerne travels with you,” the watch will accompany the players to Russia as a valuable piece of their home. “We are delighted that the team chose a watch that is reminiscent of the strong roots of Carl F. Bucherer. These roots should also give strength to the players during their time in Russia,” says Sascha Moeri, CEO of Carl F. Bucherer. 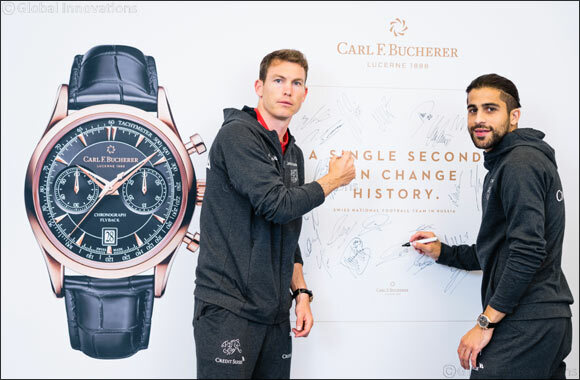 As official timekeeper of the national soccer team, Carl F. Bucherer will be cheering on the Swiss team as they enter the playing field in Russia in a few weeks' time – boosted by a piece of home on their wrist.